In 1971, Marnie Jones, FIDSA, graduated with a degree in industrial design from the Rhode Island School of Design (RISD). For two years, she designed and marketed toys for a small company in Lawrence, MA. She swore she would never design for a corporation again and kept that promise for 10 years, during which time she taught ID at North Carolina State University and San Jose State University, attended Stanford University's master's program, did a bit of consulting and freelance work and worked with Peter Lowe, FIDSA, at the Center for Design, in Palo Alto. As secretary for IDSA's San Francisco Chapter, Jones created "NEWS," one of IDSA’s first chapter newsletters, known for its renegade "light touch." NEWS won two IDSA Kudos. 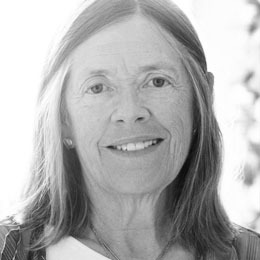 She was program chair for the 1978 International Design Conference: Thrival/Beyond Survival, and a one-term member of IDSA's Board of Directors. Jones’s last design job was for Tonka Corp. "Again, I felt ill-suited for corporate life. It was demoralizing to have sales and marketing 'dumb down' our coolest stuff. It was time for a change." What had been her hobby—music—became her next career. On a journey to Wales, she discovered her first harp. Her spiritually-oriented folk music expanded into acoustic, mostly instrumental music. "Healing is what holds my diverse work together—that is, bringing a higher balance and order to things, shedding light, finding truth. Music is design with finer threads and more creative freedom." To date, she has nine albums to her credit. Unfortunately, getting her music marketed has not been easy and boxes of CDs still sit in the garage. You can have a listen at marniejones-koenig.com. In 1986, in Minneapolis, Jones played (with lots of other presenters) for 6,000 people who had gathered to meditate and pray for world peace. As the arts coordinator, there were billboards, kid art on the walls and a 45-minute music program after the quiet. In 1991, at 43, Jones had a son, Robin. The next year, they moved to Vashon Island, WA, where she opened a bed and breakfast in an old church. The designer touch and her harp playing during breakfast, made it a favorite island inn for 15+ years. Her work with healing and music led to several tours, mostly to California; Robin in tow. At 61, Jones met and married her husband, Jim. And soon after, career #whatever got started. She is now Marnie Jones-Koenig and a healer and Guide with the Modern Mystery School. You can find her at StaroftheSea.center.